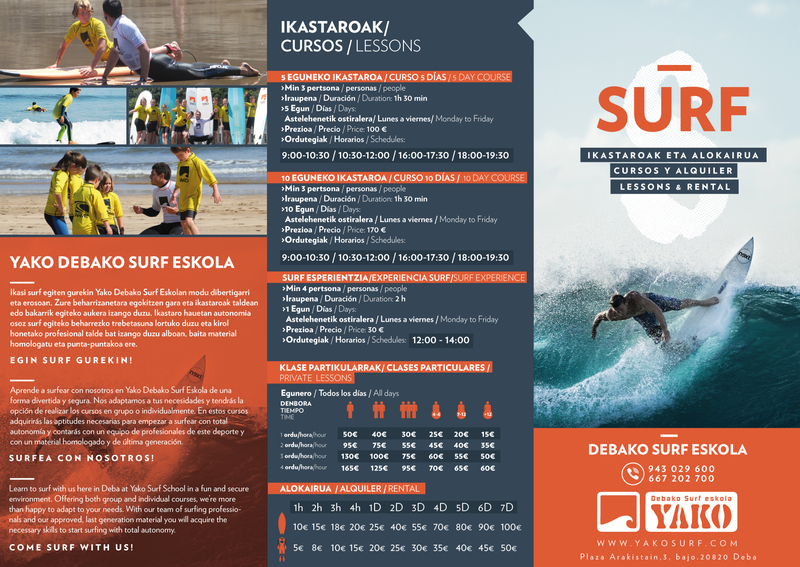 Yako Surf school is next to the beach Santiago in Deba. It offers a wide variety of courses, such as Surf and Stand-up Paddle lessons for children, teenagers and adults. The instructors know the area and they have a broad experience teaching. The school also rents the equipment. They will offer surf and stand up paddle courses in 2018. If you visit the Yako Surf Shop located in Arakistain plaza, you will find really good equipment and clothes. 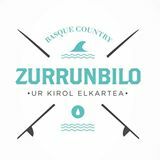 The sports department of the council, together with the association Zurrunbilo, offers surf and body board courses during the months of June, July and August for children under the age of 16. These courses are carried throug the beach Santiago of Deba and they last five days, from Monday to Friday. Surf courses are given in the mornings (10-11:30 or 11:30-13:00). However, body board courses are in the afternoons (17:00-18:30). The inscriptions in the Tourist Office from June. Surf according to your level. Respect the surfing code of conduct. Never mix alcohol and drugs with surfing. Wait at least 30 minutes after eating before entering the water. Beware of dehydratation and hypothermia. If you get into trouble, always have your board close to you. Be aware of the beach safety rules. Study how the currents flow. If you find yourself in a current, row perpendicular to it. Take surfing lessons before surfing. Be aware of the surfing code and safety standards. Be aware of the location of the lifeguards and their timetables. In the event of an accident, first call 112. 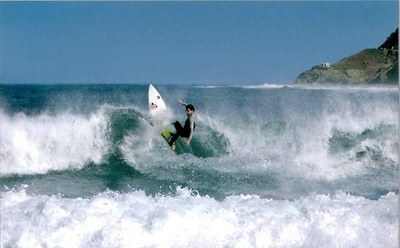 Don't drop in on other surfers: The surfer who is nearest the area where the wave is breaking has priority to surf it. Wait your turn in the line-up. Paddling towards the line-up: Do not paddle towards the line-up through the impact zone of the waves, as other surfers will be riding them. Surfers riding the wave always have priority. Communication: When you catch a wave, always let the other surfers know your intentions and what direction you are going in. Don't let go of your surfboard: Hold onto your surfboard when going against the waves and learn to pass under them. Never let go of your board, you may seriously injure another surfer. Respect: Respect local surfers, do not try to have every single wave for yourself and respect more experienced surfers. Keep the ocean and the beach clean.